Our range of Luton off-airport hotels offer the perfect way to enjoy all the perks of a night close to the airport, but at a lower price. Youll get a revitalising nights rest away from the bustle of the airport and when youre ready to head to the terminal one of our regularly scheduled transfer buses will whisk you over there in no time at all. We have 3 and 4-star options and by booking with HolidayExtras.com® you could make savings of up to 40 per cent. As always were so confident about our amazing prices that all our Luton airport hotel products are covered by our Best Price Guarantee. So get booking, and make the most of your holiday for less. What is a Luton off-airport hotel? Instead of staying within the airport grounds, off-airport hotels are situated just a few miles away. Theyll give you the smooth experience you get by arriving the night before your flight, a peaceful nights sleep and whats more they cost less than on-airport hotels. So, theyre a great way to save money without compromising on services. When you need to be at the terminal well get you there with no fuss. Most Luton off-airport hotels provide transfers to and from the terminal and if you book a hotel package with parking then car park transfers are already included in the price. Why pre-book off-airport hotels at Luton? HolidayExtras.coms top tip for making your money go even further is to always book in advance when arranging an airport hotel or parking. The earlier you book the less youll be likely to pay, so why wait? The availability of these services affects the price, so if you get in ahead of the game the fewer bookings there will be and youll get a fantastic deal. What off-airport hotels are there at Luton? We have a choice of both 3 and 4-star off-airport hotels at Luton, to make sure you can stay in the one thats right for you. Our 3-star hotels are sure to have everything you need for a superb stay the night before your trip. For a modern feel and an agreeable price tag the Days Hotel just two miles from the airport is perfect. If you prefer a more traditional furnishing then the splendid Ramada Plaza hotel might be the right choice. Return transfers are included in the price and HolidayExtras.com customers benefit from 20 per cent off food and drink. 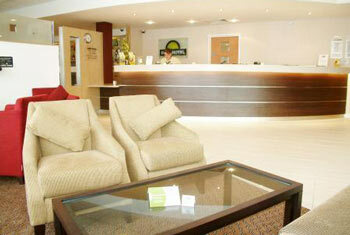 For a luxurious night at an off-airport price the Holiday Inn Luton South M1 J9 is a winner. Its a high quality hotel with a secured parking package that includes return transfers to the airport in the price. Our packages our both quality and value so you can book confidently with HolidayExtras.com today.